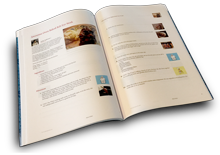 Order a professionally printed, perfect bound cookbook with a full color glossy cover and 46 recipes. Thank You Soooooo much Nancy for including my recipe in your book. May GOD BLESS YOU!!! MA WHAT A GREAT BOOK OF MANY dANISH rECIPES. i SAW SO MANY THAT i WOULD LOVE TO MAKE, AND HAD NOT PREVIOUSLY SEEN BEFORE. Thanks so much for putting the recipes all together. Great Job as usual.